Dr. Shah is a nerd at heart! He loves writing code and has been developing websites since he was fourteen years old. It wasn’t until he went with his father to his dental appointment the thought of becoming a dentist occurred to him. During his father’s dental appointment, Dr. Shah saw the dentist had amazing technology in the office and was using a digital camera to show his father his teeth. He saw the dentist make a crown for his father like an artist or a sculptor molding a shape into a functional and cosmetically esthetic tooth. He immediately started vising the dentist more to see what else he did. After finishing undergraduate studies, he wanted to somehow blend technology and dentistry together. He chose the prestigious NYU College of Dentistry to study dentistry. To further advance his skillset, he joined the Kings County Hospital’s advanced surgical and general residency program in Brooklyn, NY. There he gained advanced training in placement of implants, treating medically compromised patients, molar root canals, removable prosthodontics as well as surgical extractions. 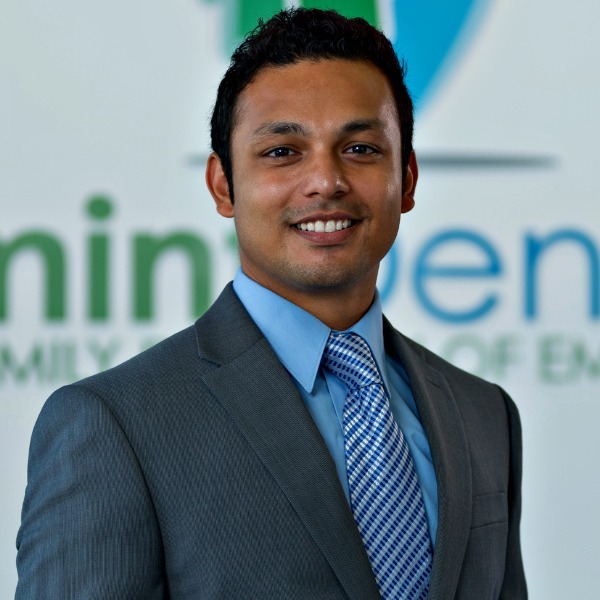 After working as an associate dentist in two group practices for few years, he decided to venture out on his own to open Mint Dental along with his wife, Dr. Radhika Kapur. His goal is to provide comprehensive dentistry for adults and kids in the most relaxed and uplifting atmosphere. He wanted to come to work at a place where it didn’t feel like work and patients didn’t feel like it was just “another dental clinic”.